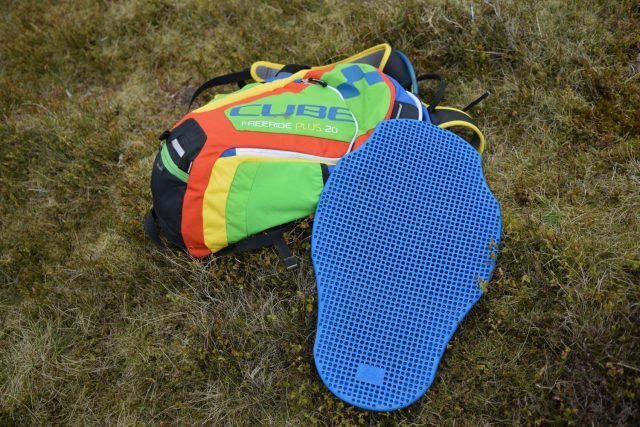 On first impression, it seems that Cube has embraced the ‘Enduro’ ethos so wholeheartedly with the Freeride Plus 20 that they’ve accidentally created My First Backpack. And it’d be fair to day that it’s far and away my 1-year-old toddler’s favourite cycling accessory (she can practically fit in it, after all). 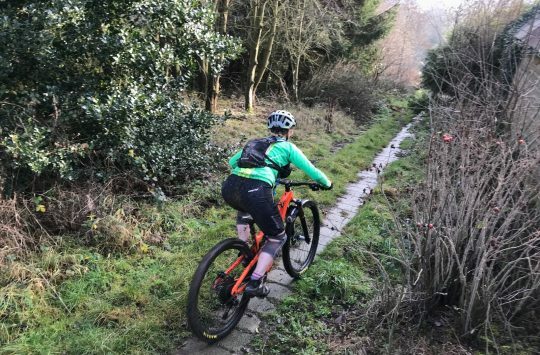 But simply to judge this book by its admittedly – uh – vivid clothes would be to do it a disservice; there are a selection of well-thought out features that adorn the Freeride, once you’ve donned appropriate eyewear (such as welding goggles). Coordinates with anything! Especially your harlequin garb. 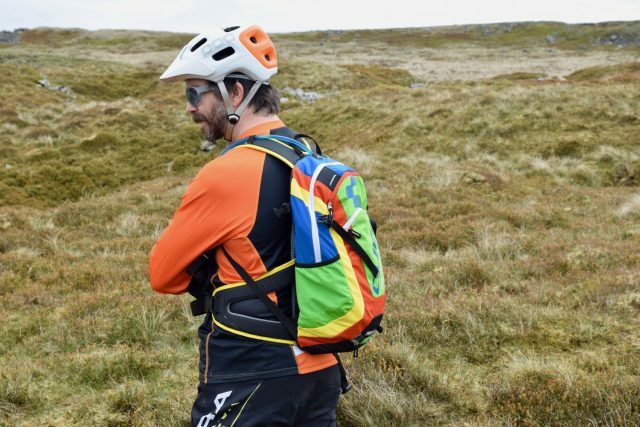 The pack is made for Cube by Teutonic backpack stalwarts Deuter, and comes with Deuter’s airstripes feature, which is essentially just a couple of foam bars which run the length of the pack holding it slightly off your back to allow perspiration to escape. Simple, but effective. 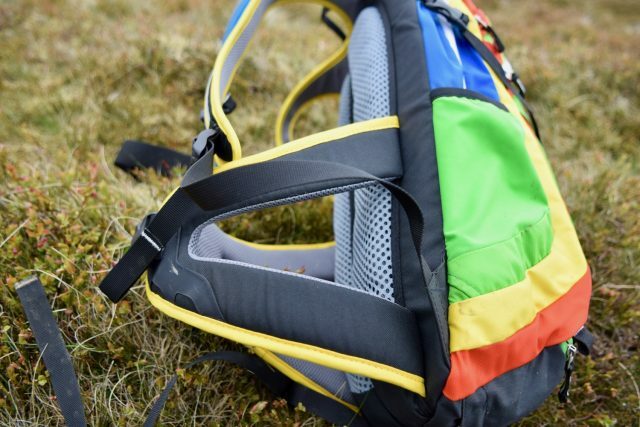 Deuter air stripes help you stay cool. 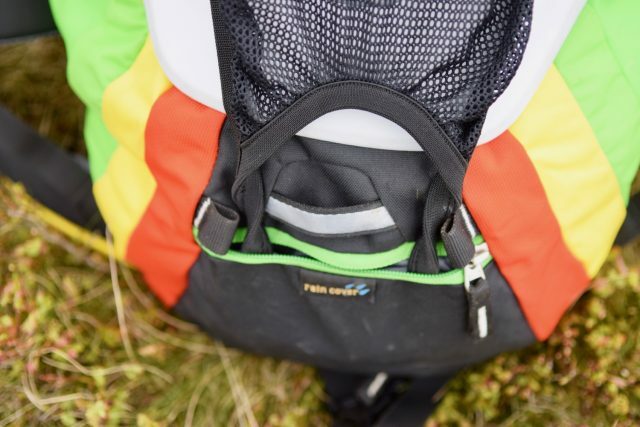 The waist straps are anchored to the bag with impressively over-engineered padded sections, which provide a degree of stability on steep stuff, although it would have been nice to see a couple of accessible pockets too. As it stands there’s nowhere that’s easily placed for nicknacks once the pack is strapped on. The Armourgel back protector is a welcome addition. There are plenty of other pockets, though. 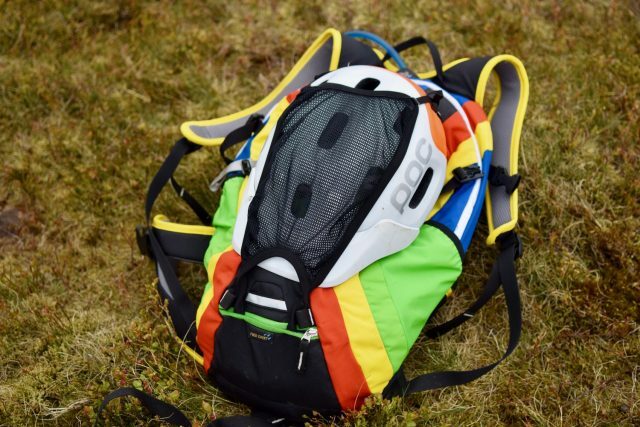 There’s a nice lined one for your phone, and the usual deeper one you can lose your small change in as well as a couple of stretchy side pockets which will hold water bottles, packable waterproofs or an unusually calm guineapig, if you’re that way inclined (who are we to judge?). There’s a (detachable) NEON rain cover, and an odd fishnet helmet/pad cover which, once you’ve fished it out from its housing and strapped it on works pretty well for an open face helmet. It’s a bit fiddly to get out and stow, but it does mean that the lines of the pack are a little cleaner. And let’s face it, those colours don’t really need anything to obfuscate their evident glory. Not even a sensible coloured helmet can mute this packs vivaciousness. 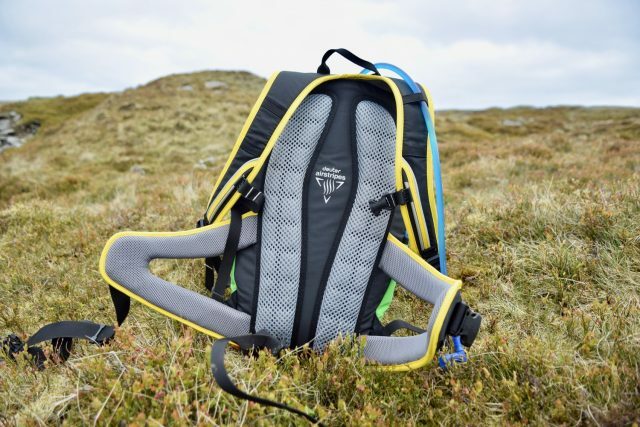 The Freeride sports a generous internal capacity of (you’ve guessed it) 20 litres, and there’s plenty of room for your favourite bladder. One’s not included for the price, though, so you’ll need to factor that in. Still, there’s room enough for pretty much everything you’d need for a day on the hill. You can further increase the capacity by whipping out the perforated armourgel spine protector, which also serves to drop the weight somewhat. The protector is made of that perforated, flexible rheopectic stuff that hardens on impact; it’s certainly flexible, but for some reason I found myself disinclined to test the impact-hardening claim. It’s a comfort to know it’s there though should you find yourself forcibly introducing the backpack to somewhere pointy. The helmet retention net is a little fiddly to get out, but well protected when stowed and keeps the lines of the pack cleaner. The pack has been a sturdy companion on many rides over the past few months, yielding many a comment from my riding-companions. But be warned – any thoughts that the colours would be muted somewhat the more you ride aren’t well founded. Even repeated washing machine cycles cannot dull the splendour; the colours are eternal and unchanging. But it’s comfy, capacious, and versatile enough to turn its hand to many things. Except, perhaps, for ninja stealth, unless you’re riding covert MTB missions in a Toys R Us. 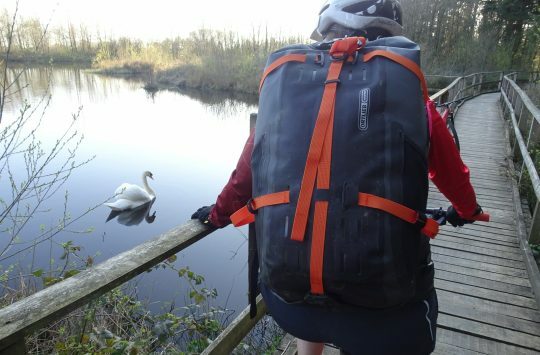 Broad, overbuilt hip straps give this pack stability. 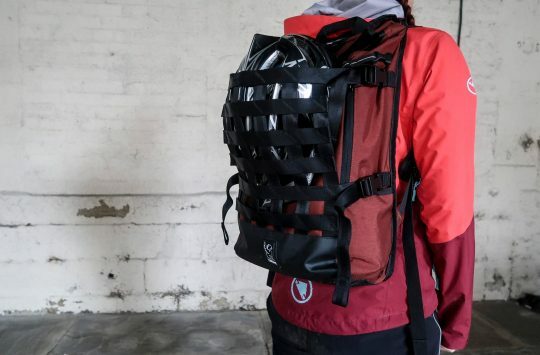 Overall: A couple of minor flaws – a fiddly helmet strap and no accessible external pockets – aren’t enough to detract from a well-thought out and stable, if supremely exuberant backpack.